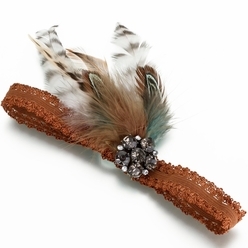 A little bit of outdoor whimsy makes its way into your wedding with this Camouflage Garter with feathers. The band is a brownish-bronze laced elastic made of a polyester/cotton blend. Feathers have delightful designs in them, grouped together and held by a nugget of large and small rhinestones which have been given an antiqued finish. One size fits most. Purchase one to keep and one to throw! Your favorite man will match you when he wears a coordinating Camouflage Boutonniere.